The deadline for articles, press releases and sponsored White Papers for the next issue of S&T Journal (e-Digest) No.5, Vol.79, May 2007 is 14 May 2007. You can submit your article or press release online. For more information and instructions of preparation click <here>. Micro-mirrors applications are attracting new comers. Although the MOEMS market is still dominated by Texas Instruments’ DLP, new challengers are coming: Microvision, Stanley Electric, Matsushita, and Philips … These players are today all targeting portable consumer applications. For example, during 2007 CTIA Wireless convention, Texas Instruments demonstrated a prototype of a DLP(R) pico-projector small enough to fit in cellular phones, digital cameras and portable media players. The DLP pico-prototype further advances TI's mobile projection technology, building on the 2006 introduction of DLP-based pocket projectors. This announcement could really boost the developments for a cost-effective, high luminance optical engine for portable electronics for the TI’s competitors ! Microvison and Symbol have already announced serial production of micro-mirrors for pico-projector for 2008 as stand alone device first. In 2010, pico-projector could be integrated into cell phones. 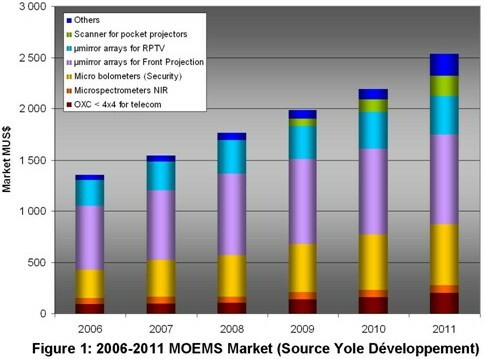 We forecast that pico-projector market could grow to more than 1M units by 2010. The development of an optical engine requires an engineering approach. Thus, collaborations are being set up between MEMS companies and LEDs/LDs manufacturers: Novalux, Osram, Luminus, Light Blue Optics … have already announced the developments of lighting source for portable applications. DLP RPTVs are another application for solid-state lighting sources. LEDs can be used as light source as they have longer lifetime than UHP, more saturated colors, quick switching time, no color wheel is necessary and they produce less heat. Thinner TV can also be manufactured with LEDs but laser diodes are competing with LEDs for this application. Thus, mixing SSL & MEMS require innovative solutions mixing optics, thermal management, electrical power conversion, electronic drive circuitry. As US and coalition force levels increase in theatres around the globe, closing the gaps in communication networks is increasingly becoming a top priority. Read on to see why you simply cannot afford to miss this year’s event ! IDGA’s Force Tracking 2007 is the largest event to lead the defense community in addressing the needs and potential solutions facing combat identification today. This is the largest forum in the US this year where all sectors of the combat ID community will come together to exchange ideas about interoperability issues. Act now! Register today to benefit from the latest information on developments and advancements in combat ID and to exchange ideas with your peers in the US military, its coalition partners, and industry. If you are not yet ready to register, feel free to request a reminder nearer the time . Alternatively, if this is not quite the event you are looking for, please check out our related events.